Simply enter your email address below to enter to win a free copy of this book! Pink explains that historically, most work was algorithmic. Many of the tasks carried out were routine and a formula/series of steps produced a correct solution. Traditional rewards were effective in motivating people to perform well on those tasks. Nowadays, however, only a small percentage of job growth is in algorithmic work, with the majority of job growth lying in artistic, empathic, complex, technological, and service-oriented work. This work tends to be less routine and more creative, enjoyable, and self-directed; but the same traditional rewards do not motivate high performance for this type of work. 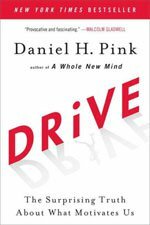 Throughout the book, Pink cites scientific research which suggests that while “carrots and sticks” can sometimes motivate employees, they can often undermine intrinsic motivation, reduce creativity, encourage short-term thinking, lead to unethical short-cuts, and diminish performance on non-algorithmic tasks. Pink also explains that employees who are motivated by rewards and money typically perform at lower levels than those who are intrinsically motivated, and ironically, end up earning fewer rewards and less money throughout their careers. As a result of this shift in the type of work needing to be done, the new challenges facing businesses, and the potential harmful effects of traditional motivational techniques, Pink argues that the current ways in which we engage and motivate people in our organizations must change. He describes three more effective tools that managers can use to better motivate and engage their employees. People are meant to be autonomous, self-directed individuals. People are motivated and perform highly when they have autonomy over their task, their time, their technique, and their team. Providing people with control over how to complete certain tasks, how to use their time, the ways in which tasks are completed, where tasks are completed, and the freedom to choose who is on their team can help build a sense of autonomy. People desire to improve and become increasingly better at something that matters to them over time. People also desire to do work that they find personally satisfying and challenging. In fact, the book cites numerous studies which show that the pursuit of intellectual challenge – the desire to master something new and engaging – best predicts productivity, performance, and engagement. Though people who are autonomous and who are working toward mastery typically perform at high levels, those who do this with a greater purpose achieve more. People want to align themselves with a cause greater than themselves – with objectives and business activities that have a deeper humanistic and “soul-stirring” cause. Organizations can develop purpose-oriented goals, dialect, and policies to foster this. In fact, a look at history’s greatest achievements points to the fact that healthy organizations are a byproduct of starting with a purpose, and considering profit as means to move toward the attainment of a larger purpose. Overall, the book makes a compelling case, supported by numerous scientific research studies, that the ways in which we commonly motivate employees need to change. "Carrots and sticks" no longer work. The way we manage and reward people must evolve because the skills and complex/innovative solutions we are seeking and the challenges we face demand a different kind of employee who is motivated by different things: autonomy, mastery, and purpose.